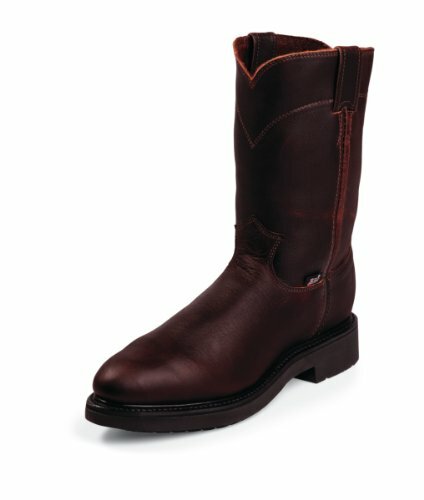 Justin® Boot Company has been handcrafting western footwear for over 130 years. They are actually now an icon in today’s western culture. 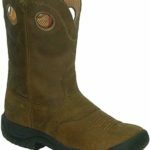 The company creates authentic western footwear that is both durable and comfortable, for men, women, and children for all occasions. 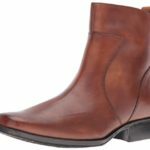 While Justin has a lot of western style boots for men, the company excels in its offering of western styled work boots. 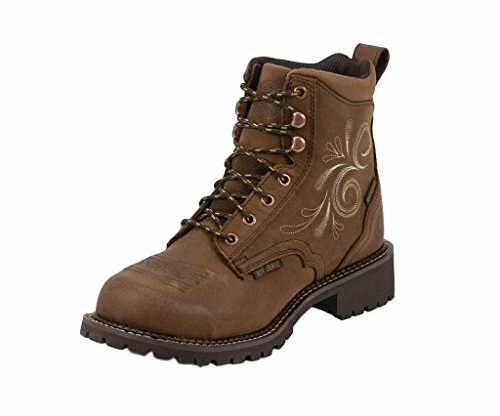 Since this 8 inch lace-up work boot is waterproof, it tends to be a little warmer than regular boots, which might become somewhat uncomfortable during higher temperatures. It has Justin’s special J-flex comfort system insoles which help a great deal with comfort. The Wyoming has excellent support and the steel toe exceeds safety standards for: ASTM, F2413-11, 175 and c75. Buyers rave about this boot, particularly about its comfort and short break-in time. If you prefer a western style steel toe boot to a lace-up, then this model is worth considering. 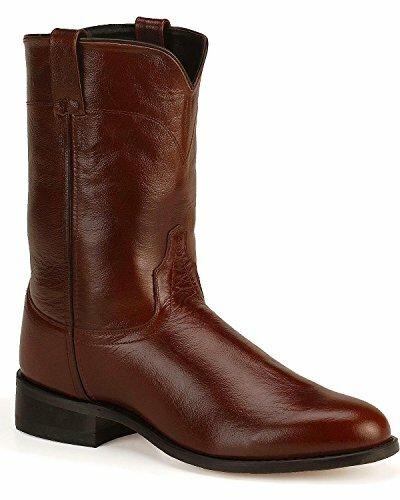 It is a lightweight 10 inch boot with an unlined shaft and Goodyear welt. The upper is made from a premium oiled leather and it is available in 6 colors. This boot has all a lot of features that make it a great work boot. The non-slip sole is made from long-wearing polyurethane that resists both heat and oil. It has electrical hazard protection and meets or exceeds standards for ASTM, F2413-05, and Class 75. However, the company has also included an impressive seven-layer double comfort system, as well. This boot has pretty much unanimous approval from buyers for fit, comfort and style. 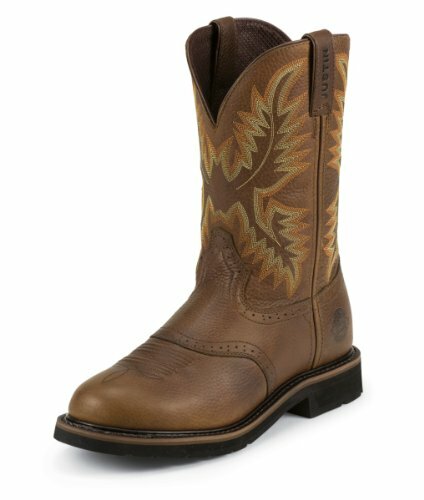 If you don’t require a steel toe, but need a waterproof boot and would prefer a western styling, then this 10.5 inch model will probably suit you just fine. It is another popular work boot from Justin due to its comfort features and really good looks. 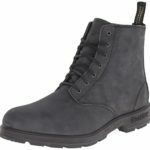 The shaft on this boot is not too tight, and the inside has a padded high weave nylon fabric. It makes the boot a lot more comfortable because you don’t have other side of the leather uppers rubbing up against your legs. This boot runs very true to size and buyers tend to love it. It’s comfortable, durable and looks great. There are no significant complaints at all about it. 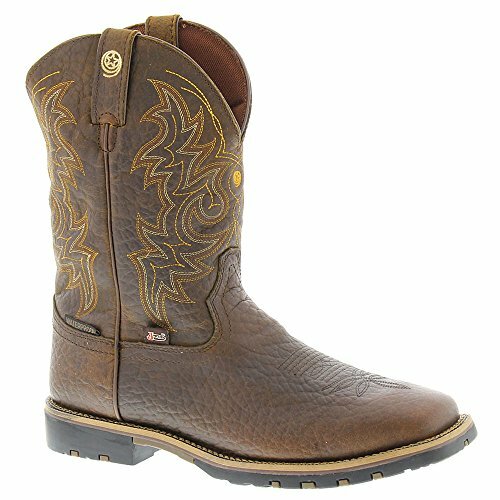 The 11 inch Stampede is a great looking boot available in a number of different colors. It has a steel toe and comfortably low 1.25 inch heel. The saddle vamp is reinforced, there is a mesh fabric lining and the inside seams are taped. There are convenient pull-on loops at the opening of the boots. The Stampede has a removable orthotic, a performance storm welt and a rugged dual-density midsole. The sturdy outsole is abrasion-, slip- and oil-resistant. 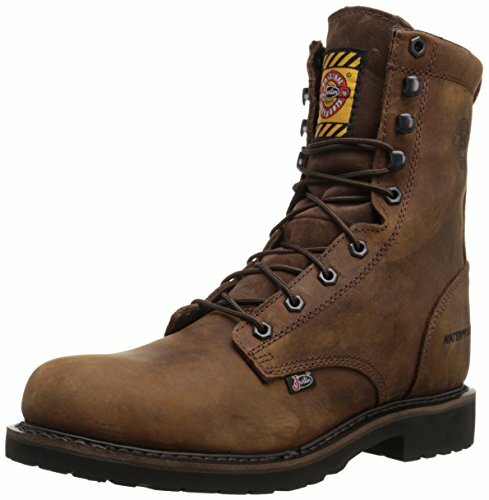 This is an extremely high quality, comfortable boot that can easily go from job sites to other environments. Buyers seem to love it. However, unlike with most Justin boots, this model does seem to run significantly large. It is recommended that you buy a size to a size and a half larger than you normally would. These are truly beautiful looking boots in 10 very handsome colors, and they are rated well overall from buyers. 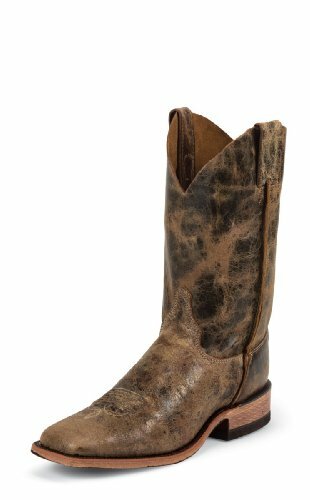 However, there are more complaints about the quality and durability of this model than there usually are about Justin boots. So these may be a case of buy at your own risk. These 10.75 inch everyday roper boots have a number of features that will to maximize your energy return rate and keep your feet happy all day long. They have the J-Flex comfort system and leather- covered Poron insoles, as well as removable orthotics and a Texon triple density insole board to provide greater support at the heel and toe. The leather-lined uppers have convenient dual pull handles. There’s no question that these are great looking, comfortable boots. It just seems to be a bit of a toss-up whether the pair you get will be well-made, or how long they will last. 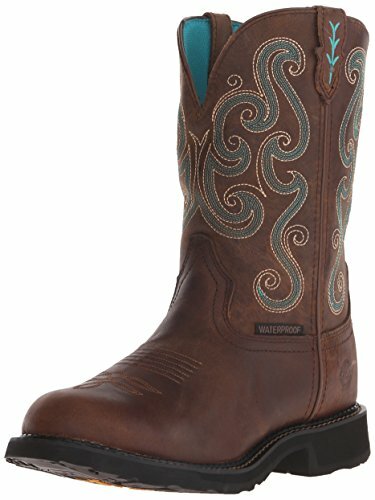 The Bent Rail cowboy boot collection is a rugged 11 inch boot with easy pull-on holes, which is available in a number of striking color options. The interior has leather lining and side seams that are taped for comfort. The cushioned insole is covered in leather and there is a triple-density insole board. The sanded long base block heel is 1.75 inches high. The smooth leather bottom sole takes some getting used to, because it can be slippery. But it is the traditional cowboy boot style, after all, and it does look great when going out in the evening. This boot has received an overwhelmingly positive response from buyers. The only thing worth noting is that it runs a bit large, so you should order at least a half size smaller than you normally would, possibly even a full size smaller. 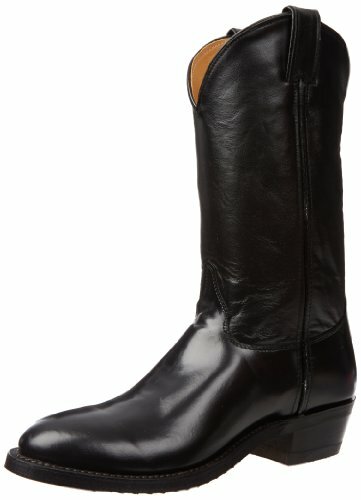 Justin does not lack in style for men’s boots, there are some truly fabulous options. If anything, the women’s line is even more striking. However, the fact that they also have such great work boots for women is definitely noteworthy. These stylish 6 inch work boots are from the Justin Gypsy Collection. 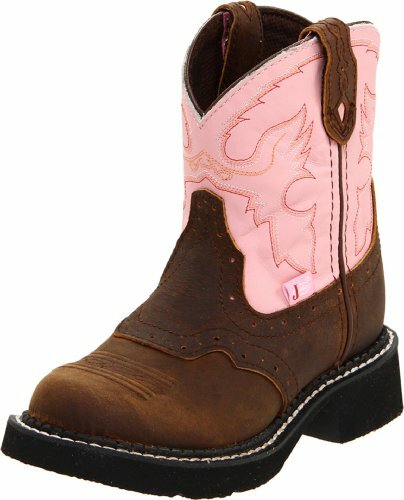 The safety round steel toe is complemented by the cute pink embroidery that decorates the shaft. The company’s J-Flex® Flexible Comfort System cushion insole is included to maximize your energy return rate. Buyers simply rave about this boot, most notably because of its comfort, but certainly also for its looks. Many women love it so much that they are actually on their second pair. This is one uniquely fashionable steel toe work boot. 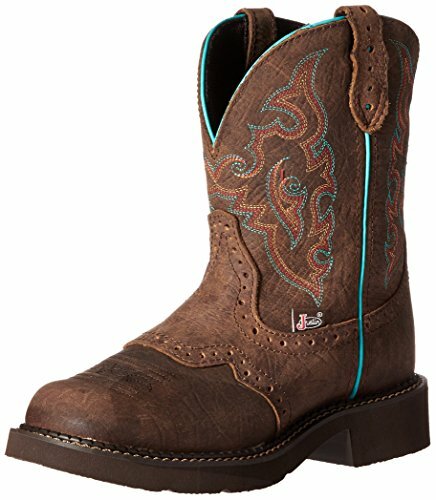 If you prefer a western styled work boot, but still want a bit of flair, then this one has a lot to offer. There is a brogue-perforated overlay that is perfectly complemented by contrast piping, and even the dual pull straps are distinguished by fancy diamond cutouts. The fabric lining keeps you comfy, while the waterproof leather construction and full interior bootie keeps your feet dry. The round toe profile provides a little extra safety. The Justin Gypsy Cowgirl Collection is all about serious fashion – and it is now offered in a steel toe work boot. 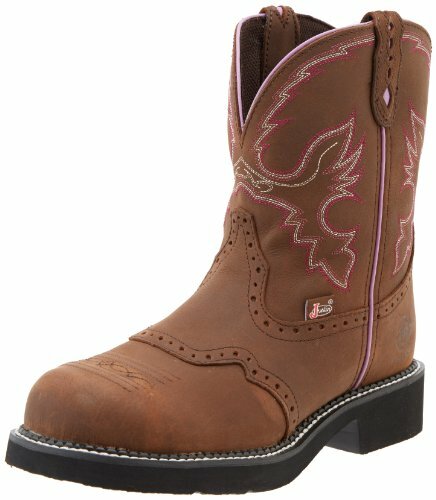 These may be the cutest and most comfortable western style steel toe work boot ever. Buyers certainly seem to love it. If you don’t need a steel toe, then this 8 inch soft toe makes for a great work or riding boot. Lots of features combine to make it comfy: a fabric mesh lining, the round toe profile, a removable orthotic insert and the notable J-Flex Comfort System cushioned insole to maximize your energy return rate. This boot is available in 10 fabulous colors, it’s easy to break in and it’s gotten rave reviews from buyers. 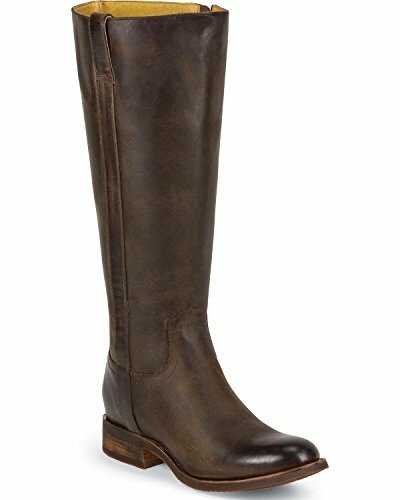 If you don’t actually need a work boot at all, then this 7 inch pull-on riding boot is a very appealing option. It’s easy on and off, has a durable sole, and is comfy right out the box. Although it has a slightly high fashion heel, the comfort insole keeps this boot pain-free. Most buyers love it, however, it might not be suitable for those with high insteps. The 13 inch Justin Damiana boot with 2 inch heel has both comfort and serious style. The uppers are fully lined with leather and have a scalloped collar, as well as easy-on pull straps. The boot has a very fashionable pointed toe profile, but the memory foam midsole and the J-Flex Comfort System deliver all the comfort you can ask for. This boot is available in 5 attractive colors and gets almost unanimous raves from buyers due to both its looks and superior comfort. No one seems to have found anything at all to complain about in this boot. The uppers on this these boots have a straight collar and pull-straps. A full-length zipper also allows for easy on and off. These boots can go from riding to running errands, and will look great in a lot of different places with its low fashion heel. The 15 inch shaft is perfect for tucking in jeans or jodhpurs. There are a couple of sizing issues, though. 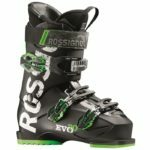 The shoe part of the boots run a little big, yet buyers have noted that the shaft is a little on the narrow side. So it may be a bit difficult to find the right size to suit both your feet and legs. 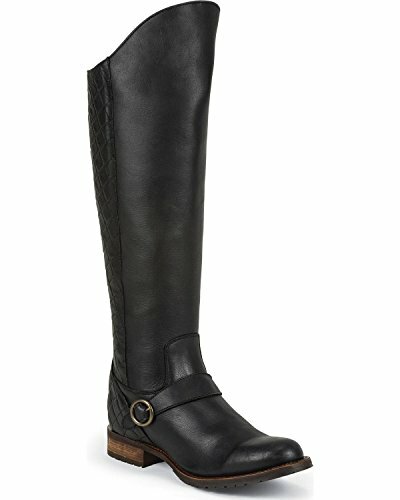 These tall women’s boots have a uniquely attractive design. The front rounds up, the back is quilted and there is an ankle strap with button accent. 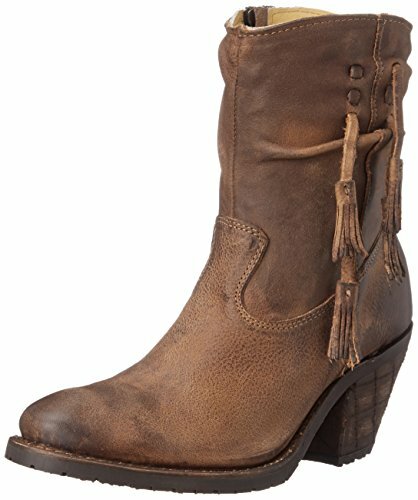 You will want to tuck your jeans in to show the full effect of the beautiful details on this boot. The low fashion heel is perfect for riding or strolling around all day. An inside zipper makes for easy on and off. It’s available in 3 neutral colors, all gorgeous. There is only one potential problem with these boots. The shaft may be just the slightest bit hard to size. Strangely enough, some buyers think it’s too narrow while others find it too wide. Justin has great boots for kids. Here a just a couple to give you an idea of what’s available. The Gypsy boot is available for toddlers, little and big kids. It’s got a short shaft and perforated leather saddle vamp. A removable orthotic insert and the J-Flex Comfort System Cushion Insole keeps it comfy for the little ones. This one is available in two colors and gets raves from the parents and the kids. 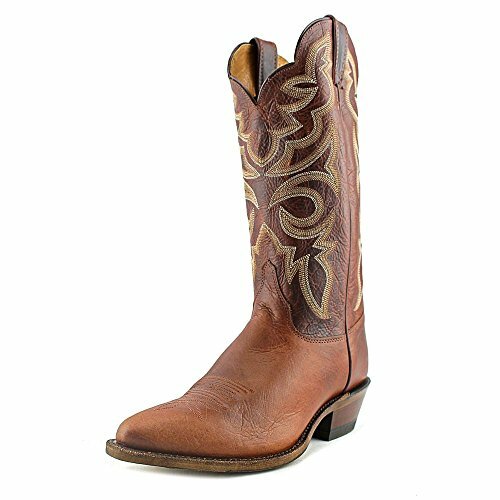 This classic 7.25 inch western boot is also available for toddlers, little and big kids. It looks great with a fancy stitched shaft to match the cowhide leather foot. A breathable leather lining, flexible sole, removable foot bed and the J-Flex Comfort System make it an incredibly comfy boot. Parents like the fact that it also has a non-marking outsole. This boot is of such high quality that it doesn’t only get raves from parents and kids, even adults who wear kiddie shoe sizes love it.